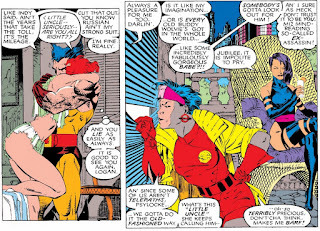 Inspired by an awful ‘90s cartoon, and spurred on by my love of the absurd, I’ve decided to cover the burgeoning comics career of a multimedia superstar, Jubilee of the Uncanny X-Men. Jubilee was fortunate enough to be filling the role of the mutant teen sidekick in the comics when the cartoon was developed, and therefore made the roster of the show, rocketing her to international fame and acclaim as a foundational member of the X-Men in the eyes of the masses. All of that is completely true, and I will acknowledge no arguments otherwise. Previously, Jubilee was an orphan living on her own. Wolverine, for some reason, is the most desirable mentor a teenage mutant girl can have. Psylocke went from a shy Caucasian telepath, to an Asian ninja assassin. Other things happened, but they’re weird and unsettling. An average fictional rogue military unit going by the name the Harriers has their eyes on Wolverine. 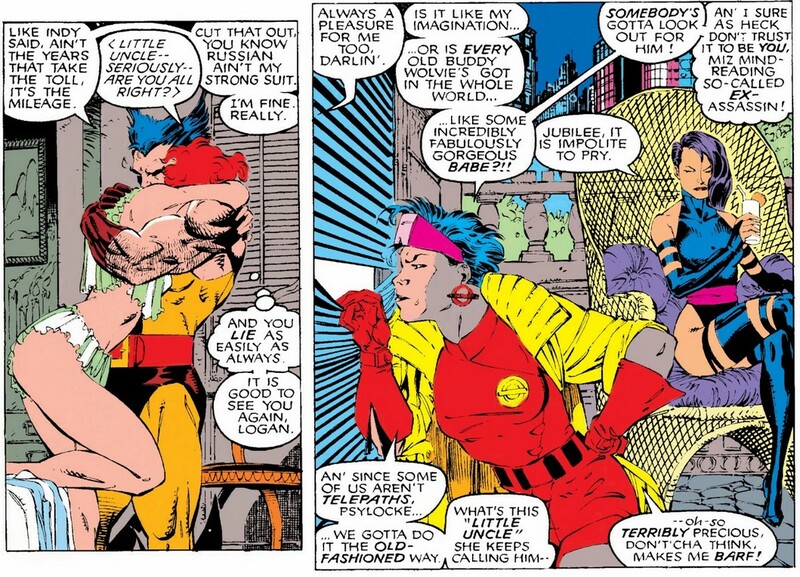 Wolverine, Psylocke, and Jubilee have made their way to Madripoor, where Jubilee is currently having a bit of a problem with the food (and with trusting Psylocke). Wolverine and Psylocke are having a telepathic conversation about how she continues to share his phantom visions of Carol Danvers and Nick Fury, when Wolverine is suddenly snatched backwards through the wall by one of the Harriers. Jubilee takes a grenade to the chest, giving the Harriers a chance to escape with Wolverine while Psylocke attends to their young teammate. 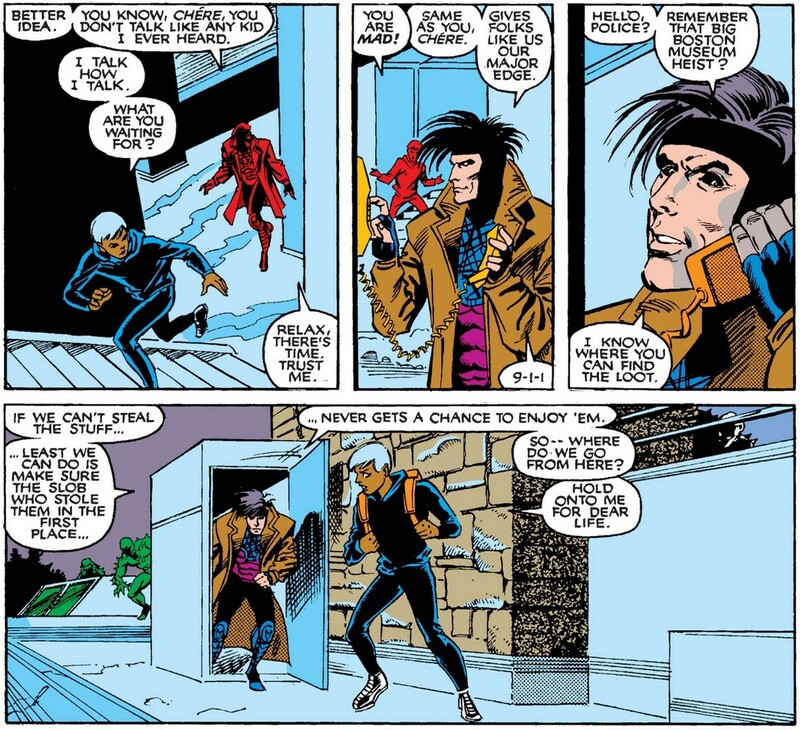 Fortunately, the grenade wasn’t lethal, and Jubilee wakes up much later no worse for wear, except for her continued intense dislike and mistrust of Psylocke. Psylocke was able to find out where Wolverine is being held, but all indications are that it’s a trap. As they prepare to enact their plan to spring Wolverine, Jubilee expresses her disapproval of Psylocke reading her mind without permission (a perfectly valid complaint). Jubilee walks into the warehouse hideout, under the guise of a pizza delivery girl, while Psylocke sneaks in through the roof and down into the rafters. Jubilee catches them off-guard and unleashes a tornado of her firecrackers, throwing the Harriers off balance and freeing Wolverine from his cage. 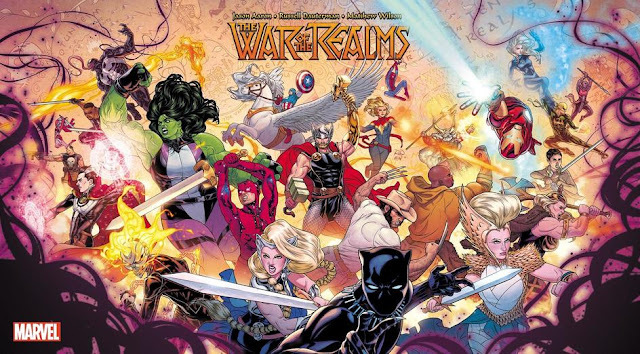 The precocious Jubilee distracts the hardened soldiers below, while Psylocke joins the fight from above. 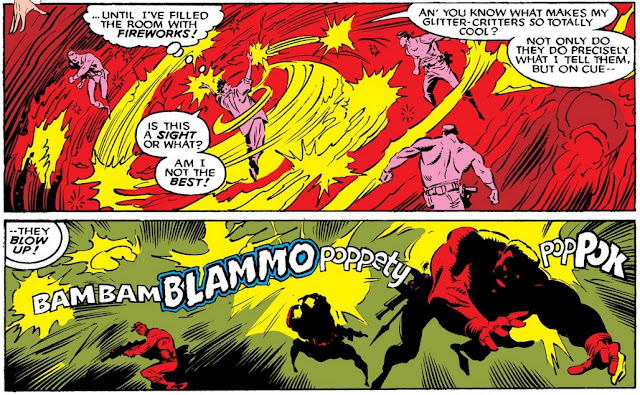 Unfortunately, the two are horribly outnumbered and are eventually subdued, until Wolverine joins the fray. But, turns out Wolverine and Malone (leader of the Harriers) are good buddies, and this was all some big training exercise. Both of them wanted to test the battle savvy of their new teams. Storm (regressed to a teenage body by the nefarious egg-shaped Nanny) is on the run from the Shadow King inside a river-front mansion on the outskirts of Cairo, Illinois. After falling from the upper floors of the house into a pool, she’s pulled from the water by a mysterious savior. 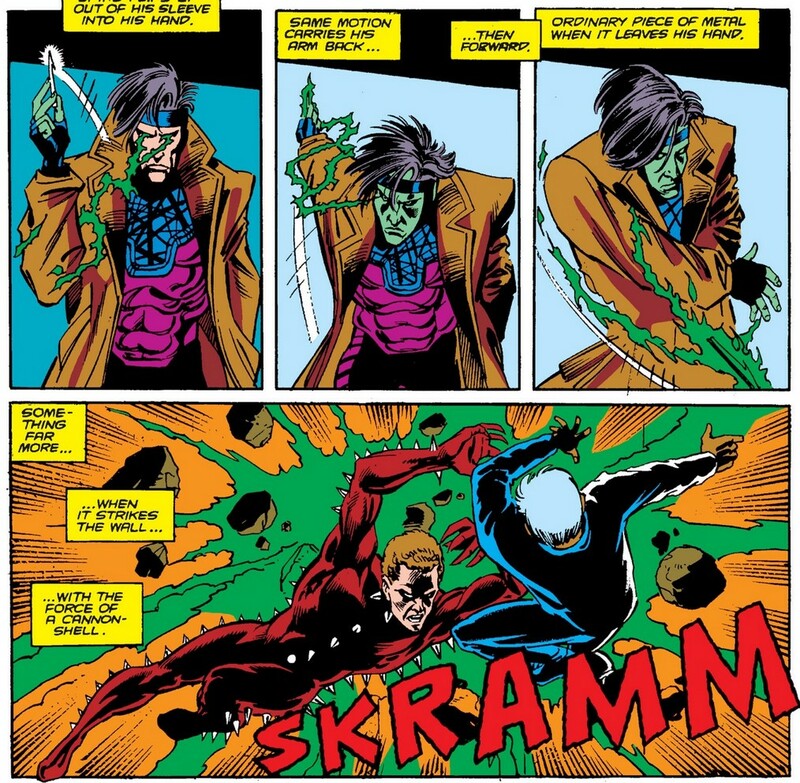 Turns out, her savior is Gambit, introduced here for the first time. He’s a thief, who just so happened to be planning to rob the owner of the mansion of his valuable paintings at the same time this dramatic showdown was occurring. 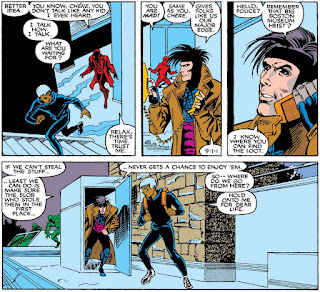 Gambit, faced with a decision to either steal the paintings, or help his fellow thief, decides to help Ororo. Eventually they are able to escape. And yet another partnership is born. This is one of the most famous covers in Marvel comics history, which makes the mediocrity of the story inside that much more glaring. 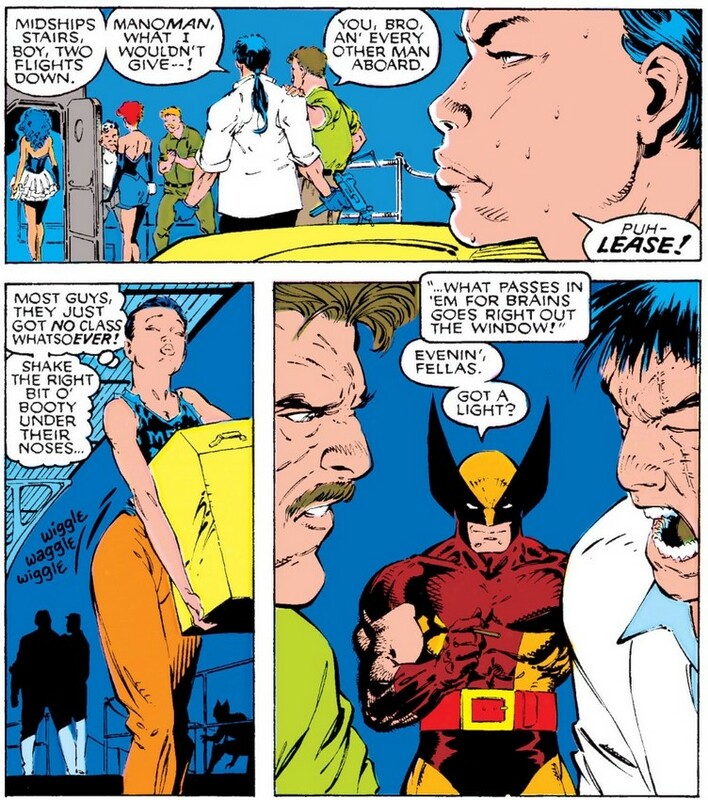 A flashback to Madripoor in 1941, sees Logan team up with a green Captain America to save the life of Natasha as a child. 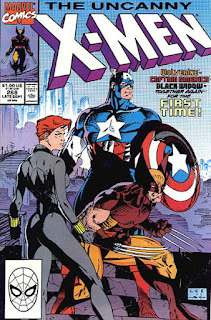 In present day, Black Widow is fighting some Hand ninjas when she’s joined by Wolverine, Jubilee, and Psylocke. 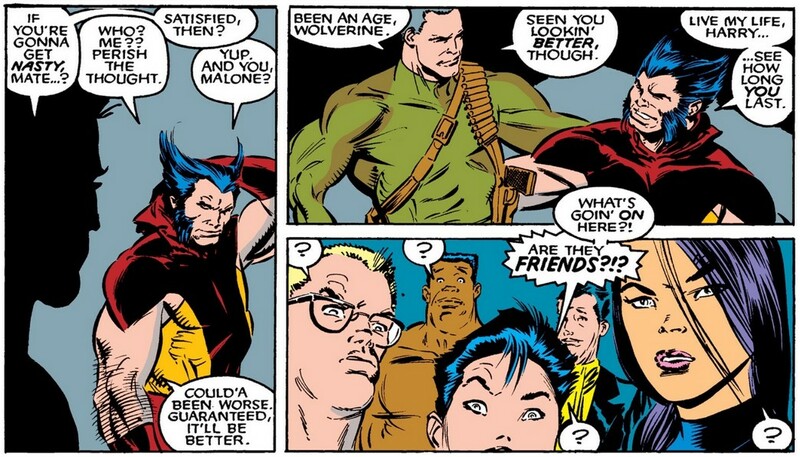 Jubilee correctly notices that every old friend of Wolverine seems to be a devastatingly gorgeous woman. Turns out, Widow is in Madripoor on the trail of the Strucker twins, which is what ties it into the flashback tale with Baron Strucker. Turns out the yacht was a diversion, and Wolverine and friends are left looking like chumps. As famous as they are for their work on the X-Men, I’m not entirely sure that Claremont and Jim Lee worked all that well together as a team. The 3-parter with Psylocke was pretty good, but those last two stories have had some truly anti-climatic endings. I can’t say the infamous new X-Men series they both launched later on in the ‘90s is known for its fan-pleasing storytelling either. Unsurprisingly, there were reports that Claremont and Jim Lee didn’t get along too well, with Lee allegedly being the catalyst for Claremont being removed from the X-Men after 17(?) straight years of being arguably the primary reason for the X-books becoming the dominant franchise of superhero comics. Right before Lee left Marvel to help form Image, to boot. Next up for Jubilee is the X-tinction Agenda multi-series crossover, but I’m not entirely sure I can cover something so horrendous without getting paid. I’ll flip through and see if I can stomach it. Either way, next week more Jubilee!